We’d love your help. Let us know what’s wrong with this preview of Just Like Rube Goldberg by Sarah Aronson. Want to become an award-winning cartoonist and inventor? Follow your dreams, just like Rube Goldberg! From a young age, Rube Goldberg had a talent for art. But his father, a German imm Discover how Rube Goldberg followed his dreams to become an award-winning cartoonist, inventor, and even an adjective in the dictionary in this inspiring and funny biographical picture book. To ask other readers questions about Just Like Rube Goldberg, please sign up. “But maybe more than anything else, everyone loved reading about Rube’s alter ego, Professor Lucifer Gorgonzola Butts. The eccentric professor invented one intricate machine after another, and none of them were straightforward. In fact, they were the opposite of straightforward and often disregarded the laws of physics. My first years as a young reader coincided with the last years in the successful career of cartoonist Rube Goldberg, the cartoon artist who drew crazy machines. I vividly recall poring over his cartoons as a kid. Several months ago, in reviewing A DROP OF HOPE, I even made a reference to Rube Goldberg machinery. So I was excited to find Sara Aronson’s lively new picturebook biography, JUST LIKE RUBE GOLDBERG. It’s fun to read about the life of someone so quirky, who ignores well-worn paths and just heads off in an entirely new direction. Sara Aronson shows how Goldberg began emulating cartoonists at the early age of four and then spent decades listening to his parent’s advice, and doing what he had to do to survive financially, while steadily practicing his art and pursuing his real dream of being a professional cartoonist. He eventually succeeded and, by time he was done drawing, he had created over 50,000 cartoons! It shows how it’s possible to find a balance between dreams and practicality. and, maybe, with patience, practice, and ingenuity, succeed at your passion..
There’s a trove of lively action in Robert Neubecker’s illustrations of the life and times of Rube Goldberg. They do a great job of complementing the Goldberg cartoons. The cartoons themselves are good, old-fashioned fun. I just hope no one gets hurt when imaginative and inspired young readers start coming up with wild ideas and plans for their own Rube Goldberg machinery! I LOVE THIS BOOK! I learned so much about this man who is synonymous with invention that astounded me. How did I not know? But it's not just the facts, it's the way Sarah Aronson weaved together a story of grit, creativity, and hope and Robert Neubecker brought to life in his illustrations that makes this book SHINE! So fun, so innovative...just like Rube Goldberg. Add this one to your classroom library and you'll spark creativity and perseverance in so many young readers. Rube Goldberg always wanted to draw, but his german immigrant father insisted that Rube get a college education, so Rube became an engineer. But after a few years of crawling through mines and drawing pipe systems, Rube moved to New York and got a job with a newspaper as a cartoonist, becoming famous for is drawings of outlandish inventions for doing simple things the hard way. Sara Aronson's simply told biography is carried beautifully through Robert Neubecker's illustrations. Keeping with Gold Rube Goldberg always wanted to draw, but his german immigrant father insisted that Rube get a college education, so Rube became an engineer. But after a few years of crawling through mines and drawing pipe systems, Rube moved to New York and got a job with a newspaper as a cartoonist, becoming famous for is drawings of outlandish inventions for doing simple things the hard way. Sara Aronson's simply told biography is carried beautifully through Robert Neubecker's illustrations. Keeping with Goldberg's style, we see Rubes' life as well as fun examples of his machines. I really love these picture book biographies which are so accessible for a wide audience. Includes a more thorough biography as well as source material. Adding this to my middle school biography collection today. Such a fun book! Like many, I grew up hearing Rube Goldberg used as an adjective for complex contraptions. Who knew the man was a true creative who refused to take no for an answer? Fun, detailed illustrations bring to life the book’s lively words (and on one spread prompt the reader to playfully turn the book from side-to-side to follow the story). A great story that will prompt discussion of the power of play, dreaming big and persevering. In her beginning pages, Sarah Aronson describes artist and inventor Rube Goldberg like this: “In a funny way, his life was just like one of his famous inventions: an improbable and inefficient chain reaction that ends up making perfect sense. Goldberg immersed himself in drawing in his younger years, but his parents didn’t support his plans to become a cartoonist, so he chose engineering. After a very brief time, he quit his job to follow his dream, to draw. And he did. After doing cleaning work In her beginning pages, Sarah Aronson describes artist and inventor Rube Goldberg like this: “In a funny way, his life was just like one of his famous inventions: an improbable and inefficient chain reaction that ends up making perfect sense. Goldberg immersed himself in drawing in his younger years, but his parents didn’t support his plans to become a cartoonist, so he chose engineering. After a very brief time, he quit his job to follow his dream, to draw. And he did. After doing cleaning work at the San Francisco Chronicle, Goldberg kept on drawing. He did get his breakthrough; they began publishing his cartoons and a column. Disaster came in the San Francisco fire of 1906. He drew comics to cheer people up. And Goldberg also realized he had to make a change, so traveled to New York City, became a columnist at a big paper. At last, Goldberg's talent is revealed. In the marvelous machines we all know and drawn with hilarious "Goldbergian" detail by Robert Neubecker, Aronson reveals Professor Lucifer Gorgonzola Butts, “who invented one intricate machine after another.” His art depicts several of Professor Butts’s contraptions—one that elaborately punches holes in doughnuts, another that turns off a light. If you or the children with whom you share this book aren't familiar with Rube Goldberg machines, they will adore them, first want to draw, then create their own. "How do you Cut your own Hair?" K. goat onto your head to take a bite of hair. Zany and energetic, this really fun book captures the spirit of the irrepressible Rube Goldberg and his wacky cartoon machines. Robert Neubecker does a terrific job of putting his own spin on Goldberg's signature style while representing it wonderfully. Excellent back matter includes extensive additional biographical information and source notes. Don't miss the reproductions of actual Goldberg cartoons inside the front and back cover. Perfect for STEM classes, and for writing and drawing prompts. I was so excited when I saw the Sarah Aronson's new book was on Rube Goldberg. I get such a kick out of Rube Goldberg machines. I had never done any research on where his idea came from, and ended up learning so much reading this wonderful picture book biography. Rube Goldberg is an artist, engineer and inventor. He followed his dreams and in doing so created something wonderful and made the people laugh. This picture book would make a fun read as students are working on understanding levers and I was so excited when I saw the Sarah Aronson's new book was on Rube Goldberg. I get such a kick out of Rube Goldberg machines. I had never done any research on where his idea came from, and ended up learning so much reading this wonderful picture book biography. This picture book would make a fun read as students are working on understanding levers and pulleys, and passive dynamic energy. Fun and very funny! The author did a wonderful job boiling down the story and highlighting all the interesting bits. It's very concise and well-written (not at all dry like some biographies tend to be). The artwork is perfect for complimenting the wacky "inventions" and giving a nod to the early 1900's. This book is absolutely certain to inspire creativity in kids. It shows just how fun STEM activities can be. A great read for kids and parents alike! 3/29/2019 ~ Follow the life of Rube Goldberg as he defies parental expectations and becomes a cartoonist who ends up being best known for his fantastical physics-defying contraptions. I loved the second-to-last spread as Aronson sums up Goldberg's life and challenges kids to follow their own dreams. While very informative about Rube Goldberg's life and inventions, this book's cheeky tone and screwball illustrations are what make it such a standout for a non fiction picture book! It's incredibly fun to read and look at, making it a wonderful choice for STEM classroom discussions and parents who want to inspire their own kids to have fun inventing! A wonderful introduction to the brilliant, Rube Goldberg! This narrative non-fiction is told with the perfect amount of flair and humor making the subject easily understood and appreciated. This STEM book will inspire creativity and perhaps a few zany inventions, just like Rube's. A great book for the class and for the lap! I love this book. 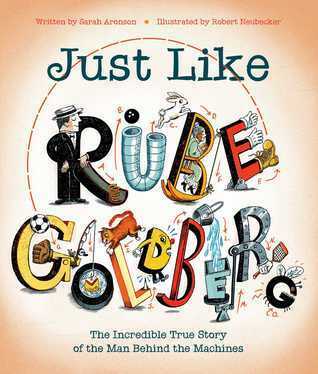 Just Like Rube Goldberg written by Sarah Aronson and illustrated by Robert Neubecker is a story that inspires creativity and embraces the power of play. It is the perfect blend of lyrical text and detailed illustrations that together capture the life of one extraordinary man and innovator. Highly recommend! Brilliant, often funny, biography about Rube Goldberg, one of the most creative mind of his time. Love his story, told in narrative form, and the illustrations that support the words are really top notch. Much gratitude to the author for a sneak peak! Will definitely add as a #classroombookaday when it releases in March! The cover is a feast for the eyes and brain. It pulls readers into a fascinating circuitous story of an impractical cartoonist and inventor who impossibly became famous for his imaginative creations. Readers are going to love it! I cannot wait to find a group of kids at school to read this with and see their imagination go wild! Hoping to have a Just Like Rube Goldberg event! This book is beyond delightful. It sparkles the imagination and makes me want to create, create, create. Bravo, Sarah Aronson and Robert Neubecker. Don't miss this lively and fascinating biography of the man whose name has entered the dictionary as a wacky, surreal engineer- inspiring STEM kids everywhere! Great for biography break read aloud. Love the illustrations. Mock caldecott? The bane of my high school physics class - the Rube Goldberg machine! So cool to read this bio! Where was this book so many years ago? Filled with colorful and engaging illustrations, Just Like Rube Goldberg will inspire young readers to think big and follow their dreams. An expertly written biography that deserves a place in any library or classroom. Though he studied to become an engineer, Rube Goldberg thought life would be much more satisfying if he were a cartoonist & an inventor. This wonderful biography is filled with fantastic illustrations bursting with energy, as well as lots of fun facts about the life of Rube Goldberg. Perfect for classrooms and libraries in search of starting STEM discussions. Sarah Aronson began writing for kids and teens when someone in an exercise class dared her to try. Since then, she has earned an MFA in Writing for Children and Young Adults from Vermont College of Fine Arts, and published three novels: Head Case, Beyond Lucky, and Believe. Her newest book is the first in a series called The Wish List! Book One is The Worst Fairy Godmother Ever! I'm so excited to Sarah Aronson began writing for kids and teens when someone in an exercise class dared her to try. Since then, she has earned an MFA in Writing for Children and Young Adults from Vermont College of Fine Arts, and published three novels: Head Case, Beyond Lucky, and Believe.